Written on April 24, 2007 by Kevin. This is your friendly reminder to check out the recall list to see if any of your children's toys or other goodies are potentially dangerous. We made a stop at the local Babies'R'Us and while walking Rylan around I decided to check out the board of recalls. Surprisingly, I finally found a product that we owned. We have been pretty lucky it seems and have had no other recalled toys. 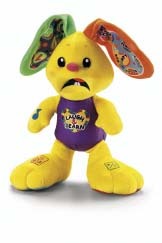 The Fisher-Price Laugh & Learn Learning Bunny though had to be our first and hopefully last. We made a quick trip to the Fisher-Price website, filled out some forms and in no time, we will be sending them back our defective toy. They return a voucher for a free toy under a certain amount and our lives continue as normal. Rylan was a bit bummed because this was one of his toys he has really enjoyed in the past. In fact, I think it was one of his bigger birthday gifts. Now the question becomes, which toy will Rylan want to replace it with.